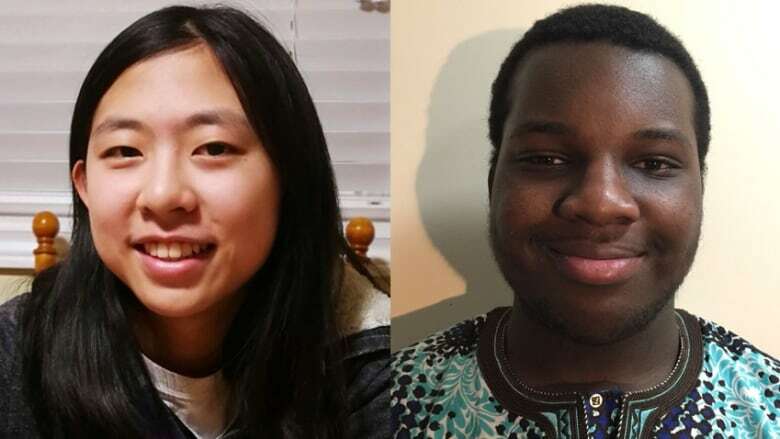 Mississauga's Stella Xia, 13, and Winnipeg's Peter Ola Paul, 16, have won CBC's national writing competition for Grades 7 to 12 students. Mississauga, Ont. 's Stella Xia, 13, and Winnipeg's Peter Ola Paul, 16, have won The 2018 First Page student writing challenge, a national speculative fiction writing competition for Grades 7 to 12 students in Canada. Shakespeare Selfie: National student writing challenge opens April 2019! Nearly 2,400 students entered this challenge, writing the first page of a novel imagining how current affairs events and trends — from the ethics of advanced technology to climate change and the legalization of marijuana — have played out in the year 2168. Award-winning writer Cherie Dimaline, author of The Marrow Thieves, chose the two winners from 10 finalists in the Grades 7 to 9 category and 10 finalists in the Grades 10 to 12 category. Xia is a student at Tomken Road Middle School. Her story Taxidermied tackles deforestation and follows a young character's eerie tour through a museum of extinct plant and animal life. "This first page shows a gift for metaphor and vivid description," said Dimaline. "We are brought into a world where the last tree was carved into a grave and the youth share their disappointment with robots. I was moved by the development of scene and structure and am eager to see what this young writer will create now." Paul is a student at Fort Richmond Collegiate. His first page Greater Than or Equal To is a fast-paced story about genetic modification, following group of enhanced athletes competing in an arena-style tournament. "This entry is cinematic is scope," said Dimaline. "With just a few lines and compelling narrative dialogue, the author lures you into a world that is as immediate and visceral as it is unique. It's quite an accomplishment to bring readers this far in with so few words. I want to know what happens next!" Both Xia and Paul will receive one year of OwlCrate, a monthly book subscription service, and 50 books for each of their school libraries. You can read both Xia and Paul's stories, as well as all the finalists, below. Winner: Taxidermied by Stella Xia, 13, from Mississauga, Ont. Sandstorm by Aniruddh Aragola, 14, from Winnipeg, Man. Evolved by Jessica Bosanac, 13, from North York, Ont. Cat and Mouse by Jacob Czypull, 14, from Calgary, Alta. Focus by Evangeline Dorval,14, from Calgary, Alta. What I Left Behind by Owen Fitzpatrick, 11, from Ottawa, Ont. Through my robotic eyes by Lucie Koesen, 14, from Toronto, Ont. The Floating City by Bonnie Lu, 14, from Victoria, B.C. Teleportation Gone Wrong by Jialin Luo, 12, from Kingston, Ont. Neptune by Manuel Quiambao, 15, from Mississauga, Ont. Winner: Greater Than Or Equal To by Peter Ola Paul, 16, from Winnipeg, Man. The Turn of a New Leaf by Lukas Coossa, 15, from Bolton, Ont. Gnarled Glitches by Yulin Harley, 15, from Winnipeg, Man. Tagged by Aminah Khan, 16, from Windsor, Ont. Life Hack by Kyra Leroux, 16, from Coquitlam, B.C. The Only Difference by Katelyn Snell, 17, from Richmond, B.C. The Incendiary Division by Carter Tsui, 16, from Coquitlam, B.C. Fly Fledgling Fly by Benjamin Wexler, 16, from Montreal, Que. The First Page student writing challenge will return in the fall of 2019. CBC Books' next student writing competition is the Shakespeare Selfie student writing challenge, which will open in April 2019. If you're interested in other writing competitions, check out the CBC Literary Prizes. The CBC Nonfiction Prize is currently open and accepting submissions until Feb. 28, 2019.